For the second year in a row, SAG-AFTRA and the Asian American Film Lab have partnered together to promote and support diversity in television and film. 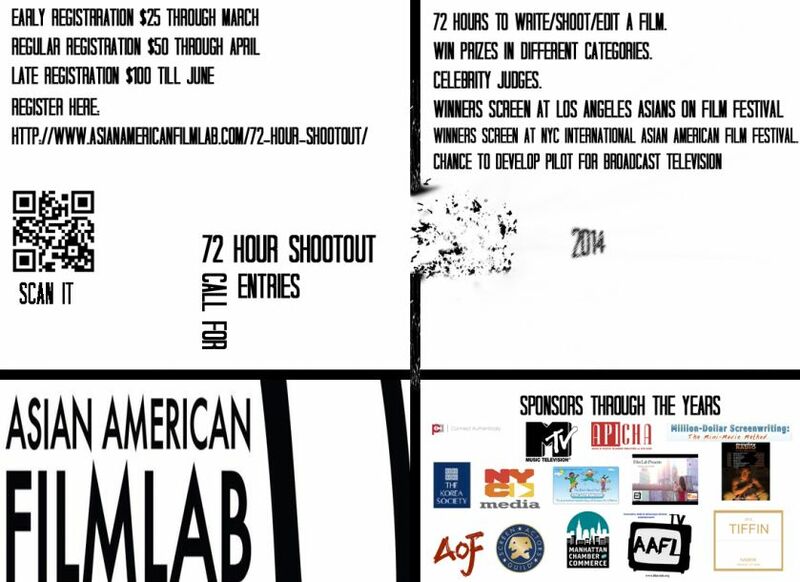 NEW YORK - May 9, 2014 - PRLog -- SAG-AFTRA and The Asian American Film Lab™ (“Film Lab”) are pleased to announce the renewal of their agreement enabling SAG-AFTRA members to more easily participate in the annual 72 Hour Shootout™ competition (the “Shootout”), a worldwide filmmaking competition promoting gender and ethnic diversity. The Shootout, now in its tenth year, has inspired hundreds of diverse filmmakers by helping nascent talent take brave steps towards a filmmaking career. The Film Lab management, several of whom are members of SAG-AFTRA themselves, expressed gratitude to SAG-AFTRA for “helping pave the way for diverse talent to gain recognition and exposure in the Shootout while maintaining protection and support for the actors.” A complete list of requirements can be found on the Shootout page of the Film Lab website at www.asianamericanfilmlab.com. SAG-AFTRA brings together two great American labor unions: Screen Actors Guild and the American Federation of Television and Radio Artists. Both were formed in the turmoil of the 1930s, with rich histories of fighting for and securing the strongest protections for media artists. Our members united to form the successor union in order to preserve those hard-won rights and to continue the struggle to extend and expand those protections into the 21st century and beyond. We are actors, announcers, broadcast journalists, dancers, dj’s, news writers, news directors, program hosts, puppeteers, recording artists, singers, stunt performers, voiceover artists and other media professionals. Our work is seen and heard in theaters, on television and radio, sound recordings, the internet, games, mobile devices, home video: you see us and hear us on all media distribution platforms. We are the faces and the voices that entertain and inform America and the world. SAG-AFTRA is committed to organizing all work done under our jurisdictions; negotiating the best wages, working conditions, and health and pension benefits; preserving and expanding members’ work opportunities; vigorously enforcing our contracts; and protecting members against unauthorized use of their work. A proud member of the AFL-CIO, SAG-AFTRA partners with our fellow unions in the U.S. and internationally to seek the strongest protections for media artists throughout the world. We work with governments at the international, federal, state, and local levels to expand protections for American media professionals both at home and abroad. It is a core value of SAG-AFTRA that our strength is in our diversity. We are committed to the broadest employment and involvement of our members, regardless of gender, race, age, religious beliefs, disability, nationality, and sexual orientation or identification. SAG-AFTRA strives to educate and engage members so that they may be full participants in the workings of their union. We are proud to be a model of inclusion, democratic organization and governance.